Being amongst the well-established organizations, we are highly devoted in providing a supreme quality assortment of Industrial Water Injection Filters. Our offered filters are widely demanded in various industrious for their optimum performance and long lasting nature. At our modular production unit, the complete range of filters is developed with the use of quality assured raw materials that are sourced from some of the esteemed vendors of the industry. Industrial Water Injection Filters are used in Oil & Gas Industry. These filters purify water before it is injected in Crude Oil Wells. Highest Quality standards are followed in our ISO9001:2008 Certified Fabrication Shop. 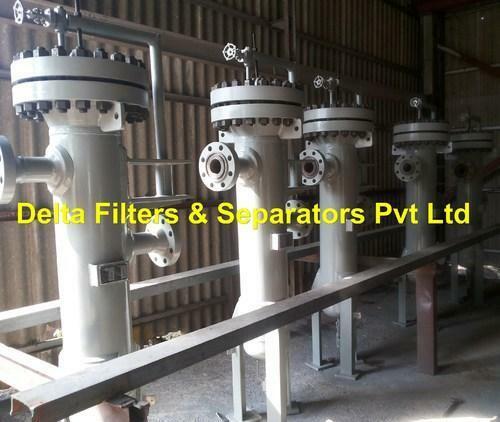 Incepted in the year 1994, Delta Filters & Separators Private Limited is dedicatedly engaged in manufacturing a superior quality array of CO2 Filter Elements, CNG Filters, Tee Strainers Filter, Oil Separators, Moisture Separators, Natural Gas Filter, Diesel Water Separator, Gas Filter Separator, Gas Filter Skid, Sintered Metal Filters, Diesel Water Filter Elements, Filter Cartridges, Y Type Strainers, Injection Water Filters and AVCAT Fuel Water Separator. In order to cater the global quality guidelines, we ensure that our offered products are developed by using upgraded machines and technologies. Furthermore, our products are highly demanded and acclaimed by the patrons for their salient features such as longer service life, high durability, corrosion resistance, high efficiency, simple installation, less maintenance, cost effective prices and reliable performance.